The lazy days of Summer are upon us and here in North Carolina, the temperatures are definitely living up to their reputation. We've been flirting with 100 degrees of high humidity all week. It's the perfect time to relax in air-conditioned comfort and indulge in a good book...or meet a new author! Hope you'll join us for the fun events happening here at The Romance Dish in August. We kick things off Monday, August 1 with Delores Fossen and Harlequin's Ultimate Western Blog Tour. I recently discovered Fossen when I reviewed Lone Star Nights, the second book in her McCord Brothers contemporary romance series from HQN. I'm looking forward to more McCord Brothers stories from this talented author! On Wednesday, August 3, we'll host the Megan Frampton Why Do Dukes Fall in Love? tour with a review by Janga. This historical romance, released July 26, is the newest installment in Frampton's Dukes Behaving Badly series. Katie Ruggle's Gone Too Deep tour stops at the Dish on Thursday, August 4 with a Q&A. Releasing August 2, Gone Too Deep is the third of four books in Ruggle's compelling new Search and Rescue romantic suspense series and has one of the best OMG! twists of any series book I've read. 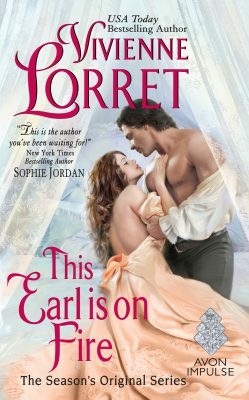 Wednesday, August 10 brings the Vivienne Lorret tour to the Dish with an excerpt from This Earl is On Fire. The August 2 release from Avon Impulse is the second book in Lorret's The Season's Original historical romance series. Janga returns with her On Second Thought review on Monday, August 15. 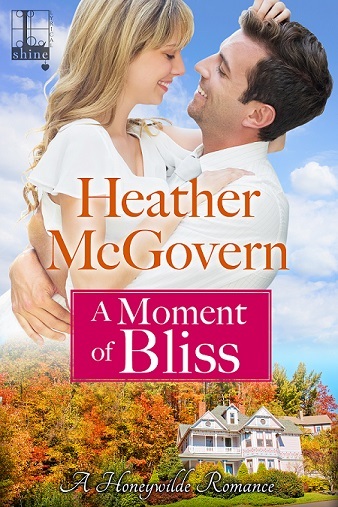 Contemporary romance author Heather McGovern celebrates her debut release day, Tuesday, August 16 with a guest post and Q&A. McGovern's debut, A Moment of Bliss, set in a family-run inn in the beautiful Western North Carolina mountains, kicks off her Honeywilde series. 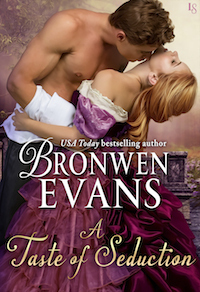 Thursday, August 18 brings the Bronwen Evans A Taste of Seduction tour to the Dish with an excerpt from the August 16th release. This will be the fifth book in Evans' The Disgraced Lords historical romance series. Historical romance author Vanessa Kelly will be guest blogging with us on Tuesday, August 30. Kelly's next book, My Fair Princess (out 8/30) introduces her new The Improper Princesses trilogy, an offshoot of her popular Renegade Royals series. As much as I enjoyed her Renegades, I love this first Princess story even more! We'll bring the month to a close on Wednesday, August 31 with a Q&A with historical romance author Karen Hawkins. Hawkins' next book, Mad for the Plaid (out 8/30) is the third book in her The Oxenburg Princes series. I'm mad for both the Plaid and Hawkins' superb storytelling skills! Have you discovered any new authors this summer? What are you looking forward to this August? Hi PJ! George and I had the pleasure of meeting up with some longtime author friends at RWA SAN DIEGO two weeks ago. We also had lovely lunch with Lenora Bell a debut author who won Golden Heart Award in 2014. I loved her first published book from May and can't wait to read the next book in the series in August! Glad you had a chance to spend some time with Lenora. I adore her (she was my roommate at RWA15 in NYC) and her books! I'm on a re-read kick right now. So much fun. Vivienne Lorret is unknown to me. Thanks for the heads up. Good Morning, PJ! My husband is in NC now. He says the days have been hot but the early morning is just delightful. I do believe NC is in for a cool down all the way to the mid-80's next week. Enjoy! Here in Florida, it is steaming! Whew! Back to books. New to me author this summer is Fiona Barton and her book "The Widow." Not necessarily a romance novel but a debut novel and well-written. I also just finished Julian Fellowes's "Belgravia." Wow. What a story. I loved it. I am so looking forward to reading Megan Frampton's "Why Do Dukes Fall in Love." I am a huge fan of hers. I am ashamed to admit that I have yet to read any of Vivienne Lorret's novels and can't wait to read "The Earl in on Fire." 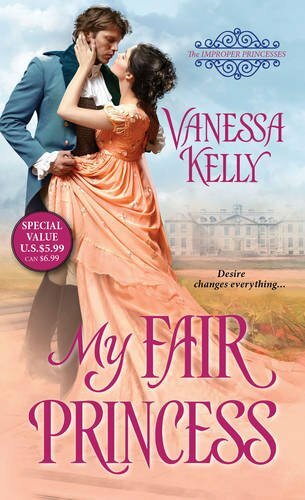 I have an ARC in my hot little hands of Vanessa Kelly's "My Fair Princess" and can't wait to delve right in. It's been incredibly hot and humid here, Connie but yesterday we began a gradual cool-down. I actually have the windows open this morning (though that won't last long). Thanks for the book recommendations. I'll have to check those out. Lots of my kind of reading this month. And I always find new authors. Emille Gamble, Anthea Lawson and Charlee Allden to name 3. No plans for August - maybe I'll be able to get more reading in! Discovered Jennifer Chase who has a couple of really good romantic suspense series. Also Holly Jacobs has become another favorite of mine. I'm a long-time Holly Jacobs fan. I'll need to check out Jennifer Chase. I haven't read her yet but I do love romantic suspense! I actually just reread The Forgotten Room. One of the best reads this year for me. I also found Simone St.James this month. I discovered Kristen Painter this summer. I quickly went through her Nocturne Falls paranormal series and am looking forward to more of her novels. I've been rereading quite a bit, mainly Kristen Ashley, Linda Howard and Susan Elizabeth Phillips's Chicago Stars series since her newest one is coming out in a couple of weeks. The other books I've read this summer haven't been too memorable. PJ, thank you for the shout-out. I'm so glad you enjoyed the book! Looking forward to spending time with you and your readers on the blog!! I discovered Maisey Yates through a free download. Yup, that really works. I bought the next two in the Copper Ridge series and am enjoying them very much. Summer is winding down here, school shopping is on the horizon. So many pretties! I had the pleasure of starting the Idillwild Series by Lynne Barron and I'm currently reading the third installment. It's amazing! I haven't read any romances in awhile...dry spell. But, I did read a phenomenal story about a month ago. Unbroken. I could not put it down. I've also been reading some Iowa Children's Choice books, some good, some duds. I want to check out Lenora Bell's books soon. They all look wonderful and I'm looking forward to being able to read some of the historicals.